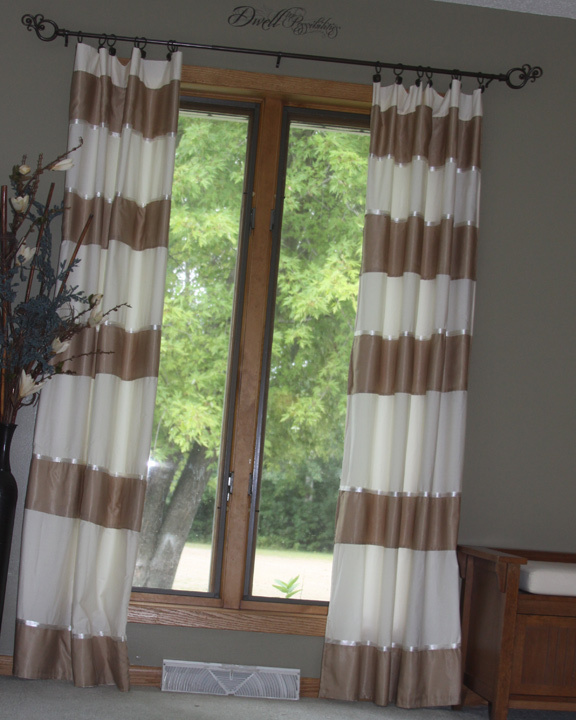 These beautiful striped curtains were my inspiration for this project- the moment I saw them I knew they would look lovely in or living room. To buy window treatments like this was way out of my budget, so I used one sheet and some other things I had around the house to get the same look. I first purchased a Mainstays flat bed sheet in off-white from Wal-Mart. The sheet was less than $10.00 and was almost the perfect size. I also bought 4 rolls of satin (no wire) ribbon from the Dollar Tree. 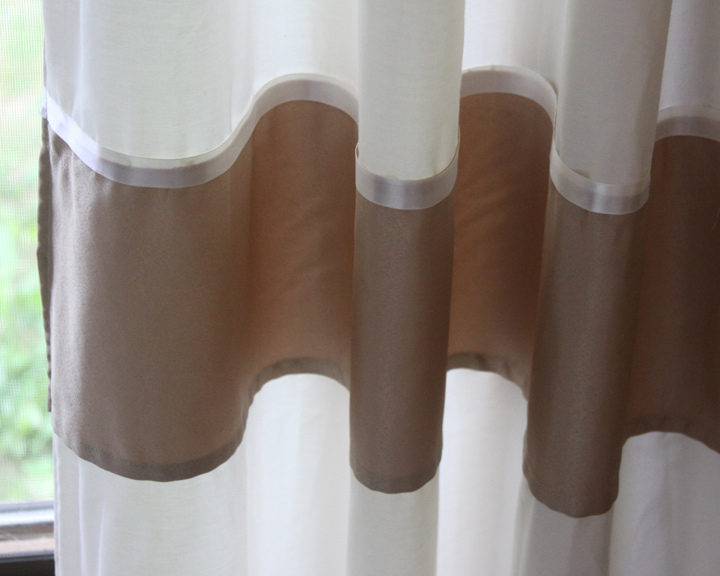 I went home and pulled out an old king-sized gold bed-skirt that I was keeping for no-apparent reason. The comforter that it matched was long gone, and I knew I wouldn’t be using it as a bed-skirt again. It was just the right shade to match my off-white bed sheet for my striped curtains. I first washed and ironed the sheet to get out the wrinkles from being packaged. This was a tedious, but necessary step. I cut the sheet down the middle and hemmed the unfinished side (that I had just cut). 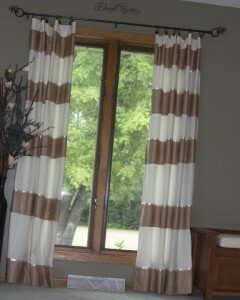 The next step in this project was to measure the length that I wanted the curtains to be. I held the curtains up where the rod to hang them would be and made a line on the sheet with chalk where I wanted to trim. I wanted them to just touch the floor and not get bunched up at the bottom. Next I cut and hemmed the bottom. To create the stripes I got out my old bed skirt and cut the skirting off from the fabric that goes under the mattress. I cut all the pieces the same length and hemmed up the unfinished edges. I then laid the off white sheets on the floor and measured out the spacing between the stripes. 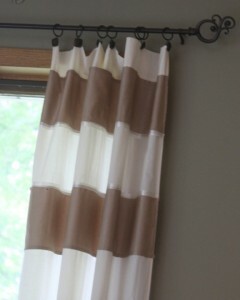 I pinned each gold stripe into place and then used iron on hem tape to attach. I think because of the thickness of the fabric the tape did not hold perfectly so I did sew the stripes on as well. 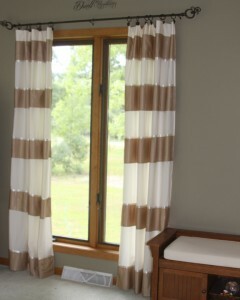 Any curtains in our house get used as hide-and go seek spots so I wanted them to be sturdy! The stripes were looking great, but needed a little something. Because I was re-using a bed skirt my lines were not perfect (or maybe because my sewing skills are still lacking), so I sewed a piece of ribbon on top of each stripe. This worked perfectly to hide any imperfections, and added a special touch! Makes them just a little fancy, I think! I hung them using some curtain clips that I already had ( I believe they were from Target) and a inexpensive curtain rod that I found at the Dollar General for $8.00. Now remember that these do not have a backing on them so from the outside they just look off white, but from the inside have a beautiful striped pattern. They keep the light out wonderfully, and are so pretty when the sun hits them, it’s like they are glowing! I would say this is one of my favorite projects to date. Not so much to do, because it was time-consuming, but the end result was so worth it! They have the exact look that I wanted for our living room. I enjoy looking at them every day! They are dramatic, yet sophisticated. No one ever guesses that I made them, let alone from a sheet and a bed skirt. They are by no means technically perfect, but they are perfect to me. It is so rewarding for me when I can reuse something that I have and create something new exactly what I wanted for far less money! Love this! Easy, cute, frugal, and fun! Hope you don’t mind I will be adding this to my pinterest board! I’m so glad you like them! Of course, I don’t mind a bit – thanks for sharing it! They are beautiful! I would be proud to hang them in my den or living room.